To be clear, I have no idea what Jane Jacobs would do. Rather, I prefer to think of the question as a civic provocation — a continual challenge for all of us to think about what’s best for the city and its residents, because that is what Jane Jacobs did. So, to my two recent interlocutors, I will say that you’re probably dead wrong. If Jane Jacobs were alive to witness the surreal chaos taking place since Ford came to power, she wouldn’t flee or despair. My bet is that she would be girding up for battle, and, what’s more, relishing the prospect. Over the past several days, I’ve tried to imagine my way into the mind of the woman who defeated transportation czar Robert Moses in New York in the 1960s, and then came to Toronto and reprised her victory against the Metro bureaucrats plotting to destroy the downtown with a grid of freeways in the name of efficiency. Jacobs wasn’t shy about making her views known to those in power, and I’d expect she would have phoned up Mayor John Tory by this point and told him, in no uncertain terms, to get on with debating Jennifer Keesmaat about the future of Toronto. The mayor’s unseemly tactic of trying to avoid one-on-one mayoral debates with Keesmaat is not only disgraceful, but also contrary to the fine tradition of extensive mayoral discourse in Toronto elections (and in which he has participated). His tactical reticence means that Toronto voters — who have had their election all but snuffed out like a dying ember — won’t have a proper opportunity to judge for themselves who among the two leading candidates is best suited to stand up for Toronto in the years to come. Indeed, Tory’s disinclination to engage with Keesmaat poses troubling questions about further capitulations in what I fully expect to be the Tories’ aggressively interventionist approach to the city. Jacobs, I suspect, would have dismissed the Ford government’s entire assault on the Toronto as illegitimate from the get-go, constitutional division of powers included. What’s more, I doubt she would have expended much energy rebutting the Tories’ specious justifications (inefficient council meetings). The out-pouring of criticism about the Ford government’s unprecedented bid to suspend Charter rights is crucial, but there’s another important point that’s been overlooked — one which speaks to Jacobs’ deep belief in grass roots accountability and the vitality of urban economies. My reading of Jacobs’ worldview is that she would be reminding us of the intimate relationship between a city’s liveability and those local governance structures that encourage, as oppose to minimize, civic engagement. Long and even difficult debates about the city’s shape and its future are features, not bugs. Evidence? Consider the fact — weirdly overlooked in this extravagant mess — that Toronto now consistently scores at the top of global rankings for liveability, business costs, and the vitality of sectors like tech, financial services and health care. We have more cranes in the sky than any other place in North America, and 7 million square-feet of new office space under construction in the core alone. Tourism is soaring. And though we’ve had a lousy, violent year, crime remains low for such a large municipality. If council and Toronto’s local government was as gridlocked and inept as Ford alleges, how did the city generate so much success? It’s also worth remembering that the deep engagement of the local residents and business people who halted the city-killing infrastructure projects in the 1960s laid the foundation for the wealth of present-day Toronto. We need more of this, not less. In other words, to dismantle or hobble institutions of civic engagement in order to shave a few hours off monthly council meetings is to gamble with the vitality of the core of an urban region that generates half of Ontario’s GDP, and therefore pays for much of the social, health and infrastructure provided to the rest of the province. Bill 31 and the threatened subway upload won’t sate Ford’s hunger for upending local government in Toronto; what we’re seeing now is just the beginning. So I’d say it’s entirely appropriate at this point to ask whether the Ford government’s campaign is destabilizing to the city’s economy. To my eye, his threats and the chaotic way his government has conducted this first attack telegraph uncertainty and raise the question of whether he’s going to kill the goose that laid the golden egg. Because the provincial government invoked the nowithstanding clause, the mounting opposition to Bill 31 has succeeded in engaging large swaths of the legal community as well as nationally prominent public figures across the political spectrum. Now it’s time for the city’s business community, the non-profit sector, the post-secondary sector and civic advocacy groups to speak out. After all, these are institutions with much to lose if Ford commandeers municipal government in Toronto. One of the key lessons of the Stop Spadina movement is that Jacobs and the other organizers were relentless in their push to broaden the coalition’s base, forge non-partisan connections to individuals in a position to influence government decision-making, and demonstrate the economic and land-use implications of Metro’s destructive plan. I only interviewed Jacobs once, and that was about 15 years ago when the city was trying to revive an ill-considered scheme to drive a mini-expressway from the Gardiner, through Liberty Village and on to the corner of Front and Spadina. She wasn’t in an especially talkative mood when I called – Jacobs was elderly by then, and still had a lot of work she wanted to complete – but warmed to the topic when I said I was interested in her views on the Front Street Extension. 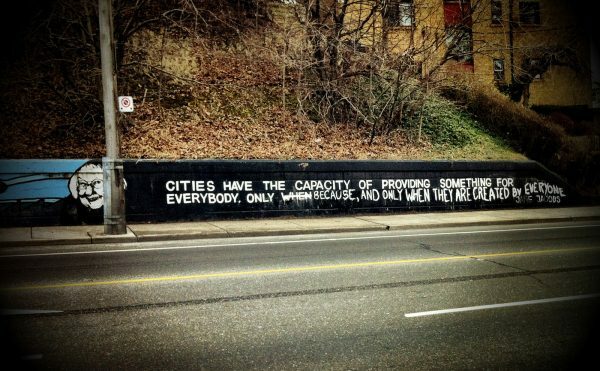 So what would Jane Jacobs do? She’d be digging in for a long fight. From what I recall, Jane Jacobs saw countries in terms of great cities and their hinterlands. The current fracas in Toronto is a city’s hinterland telling that city how to run itself. The city is the goose that lays the golden eggs — doing anything to the city risks strangling it. When a highly successful former Ontario Premier and a former Prime Minister, both Conservatives, chastise Doug Ford for intemperate use of Notwithstanding to cudgel Toronto into submission, I’d like to think that it’s the fierce and beady-eyed spirit of Jane shedding light in the darker corners of their minds. Fanciful, I know, but thanks, John, for reminding us that her spirit and her fight are present for all of us who love our city and want to stand up to Ford’s tyranny.